Today was the big day. I set this timer on my iPhone nearly a year ago and we have been patiently watching the days count down. We are still 9 days out from actually meeting Dory in person, but this was the day I had to be ready to leave home for around 7 weeks with everything we needed packed in the car. 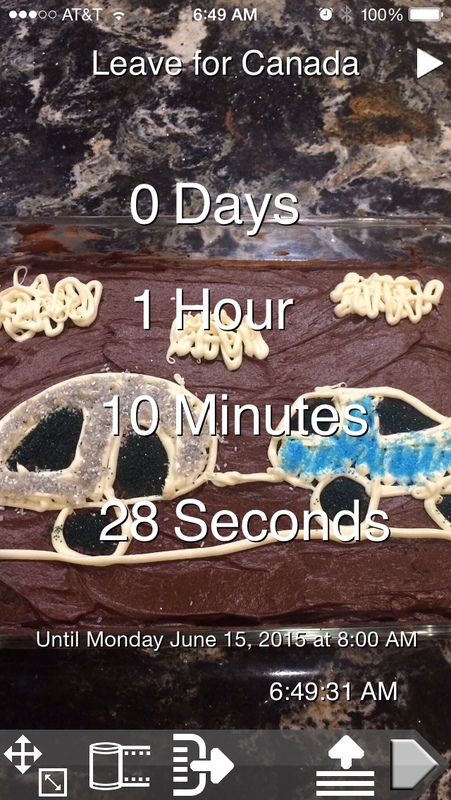 From the time I set this timer, we have bought a new car and a new bike for me, we’ve refinished our driveway so Dory can get into the garage, and we’ve researched and purchased a carload full of trailering provisions. It all had to be ready to hit the road with me bright and early this morning with no turning back. I’m going to call the first 43 minutes of the trip a “transition time”. This was the period when it all hit me that I was actually going to do this. I went through a rapidly fluctuating series of wild swings ranging anywhere from euphoria to terror. There may have been some crazy tears involved during this time. Somewhere past the Martinez Bridge I shouted out loud, “This was my f***ing idea!” That settled things for a bit. For the next two hours, I began easing into this reality. I also adjusted the seat a lot. The rest of this paragraph is going to be all about how much I love my car, so you can skip ahead if you are not terribly interested. 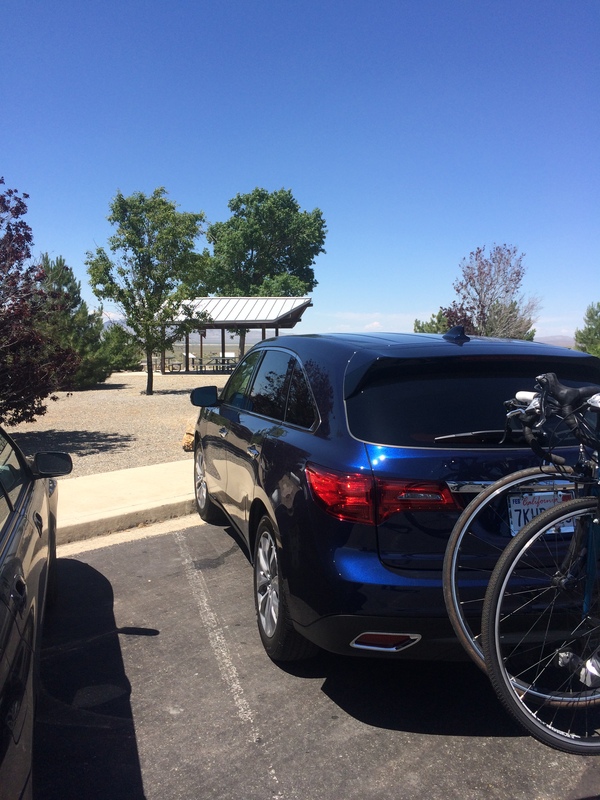 The reason I had to get the MDX is because, against my better judgement, I went and sat in the seats in a dealership. 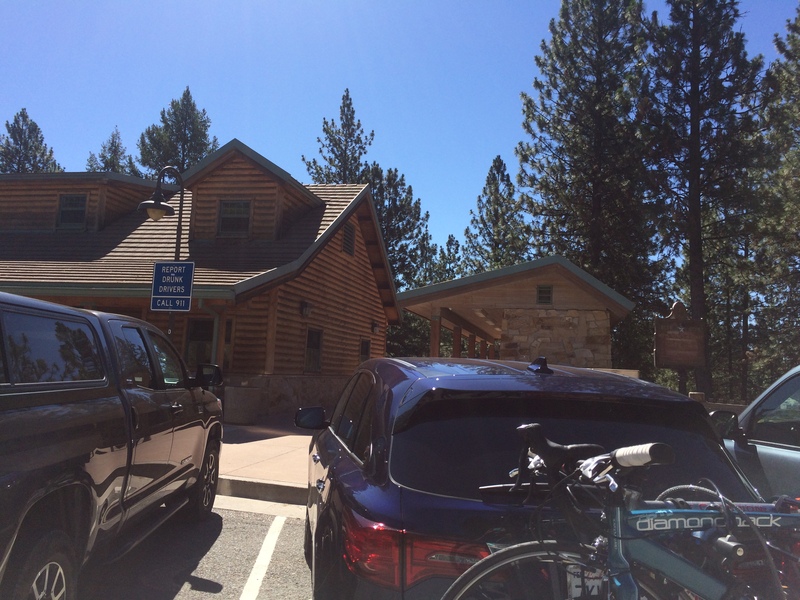 I had just returned from an Ashland trip in the Outback, and my lower back was hurting after a long drive. 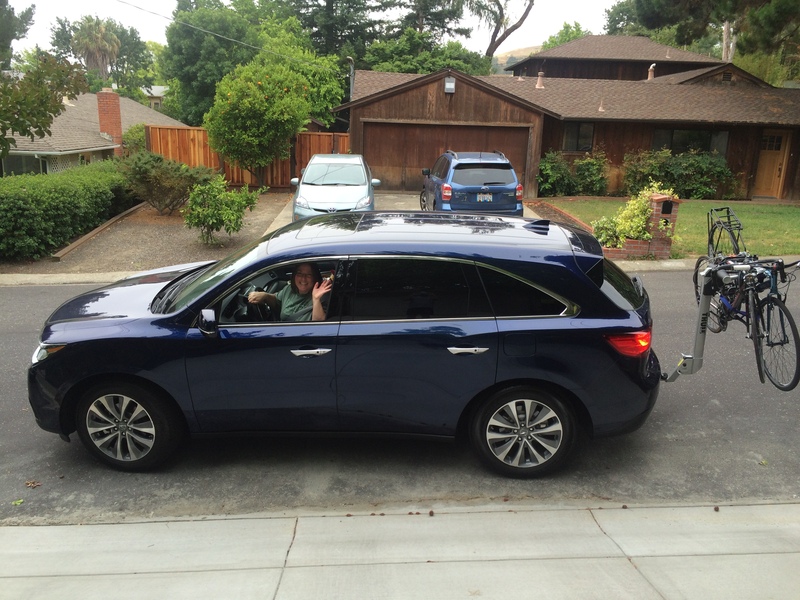 I’d already decided I wanted a new tow car and the Toyota Highlander was the choice at the time. After the back pain experience, I sat in a top of the line Highlander on the lot for as long as the salesman seemed willing to let me. I wasn’t in love. So I went against better financial judgement and sat in an Acura. Seriously, the seats are amazing. Highly adjustable, good lumbar support, soft yet firm in all the right places. The steering wheel adjusts back and forth and up and down also, AND the car saves all the little micro adjustments to memory so it freaking welcomes you back every time you unlock the door by moving things into your personal pre-programmed position based on whose key fob it recognized! That aspect actually freaks my daughter out because it comes a little too close to sentience for her liking. I’m all over it though. So today’s drive really didn’t take a toll on me in terms of soreness or kinks or anything. 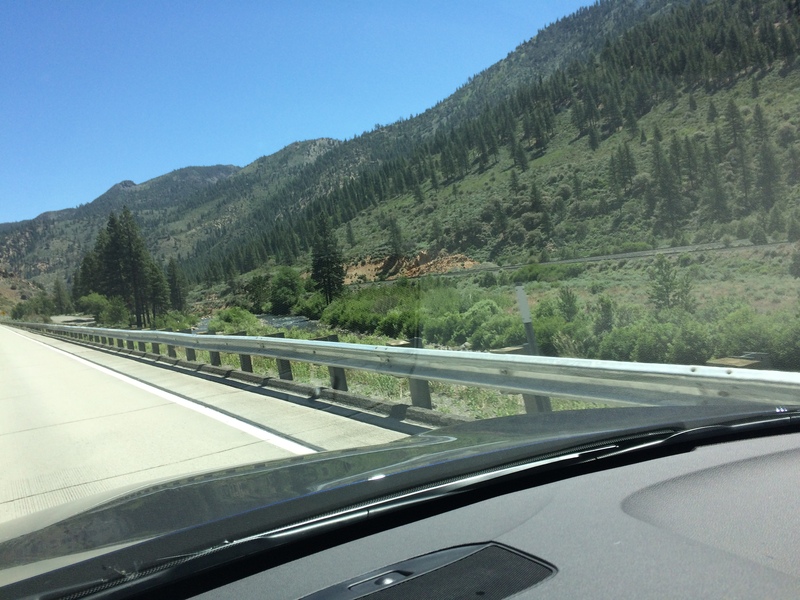 As far as that goes, I could have driven longer. 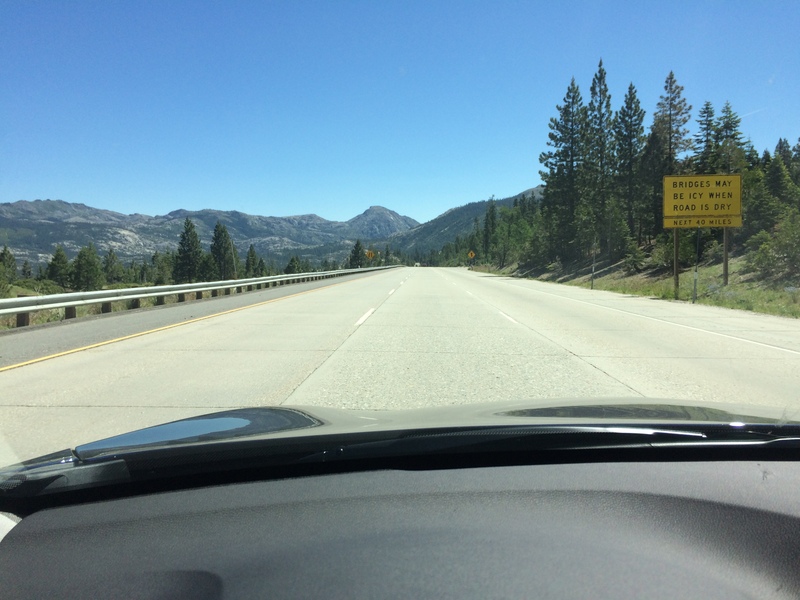 By the time I hit Donner Pass, I was feeling downright giddy. This will be another plug for my car: it is the quietest car I’ve ever driven and the sound system is incredible. Plus, I have been gathering some very fun tunes for a while now. There may have been some loud and gloriously off key singing involved during this time. 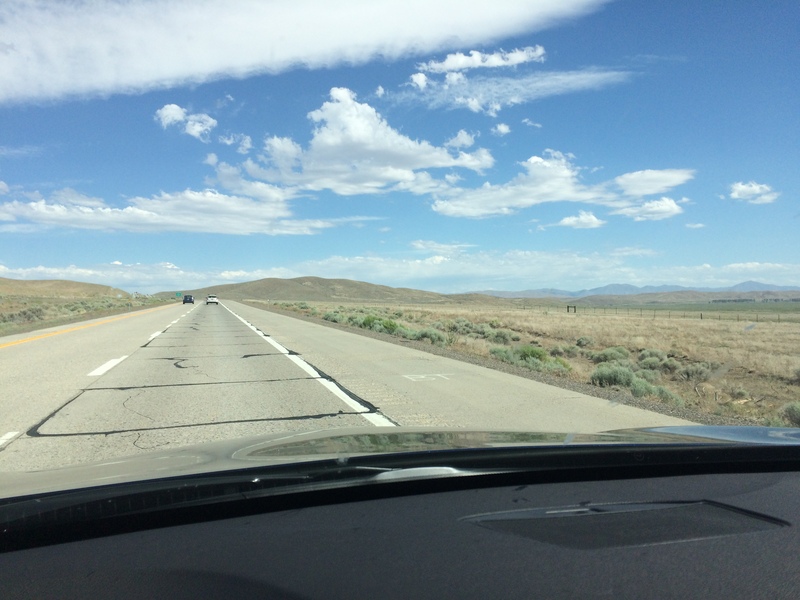 Coming into Nevada, it was hot and flat and gusty. And I got a terrible sandwich I really should have seen coming from a truck stop market refrigerator. 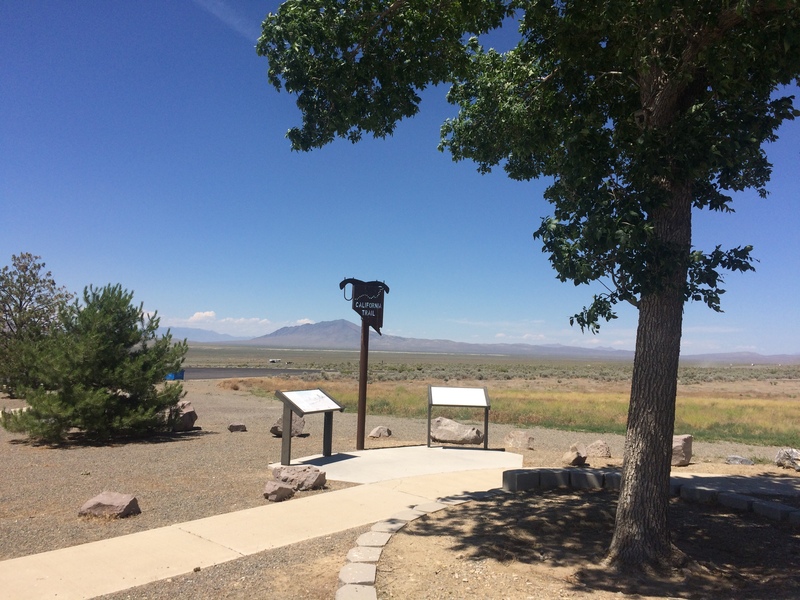 Sorry Nevada, I’m sure there are nice parts of you, but that’s all I’m going to remember from this trip. I pulled into Elko a little short of 5pm. Nice time to stop. 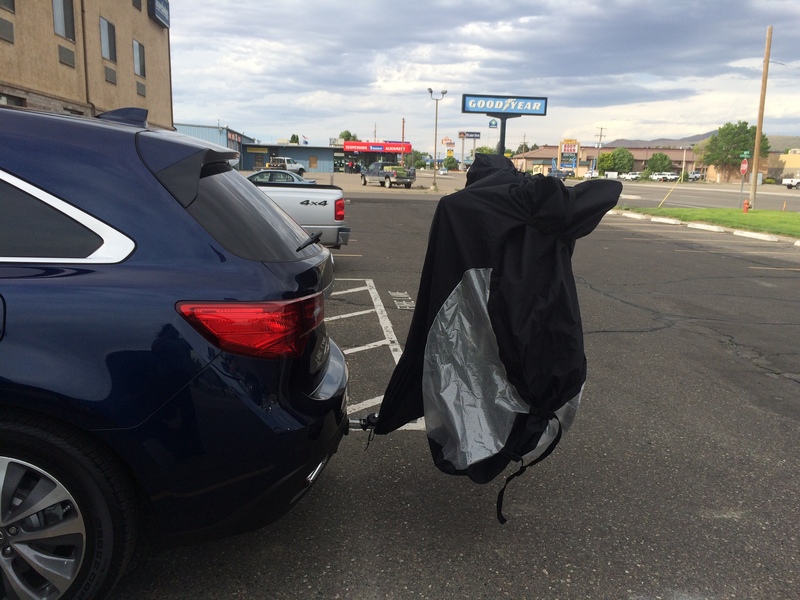 I put our bike cover on the bikes just to protect from any rain (ha!) or would be thieves. We have so many locks on these guys though that they’d have to be damn determined and it’s not like these are designer bikes. Overall, a good start. Total miles: 492.9. Total engine time: 7 hours, 58 minutes. Laughed out loud reading this installment! I am going to have to find a bridge to yell over as well!!!! Don’t forget to head and shoulder dance a lot when you come out of shock mode. That helps. Loved your terror vs. euphoria. I have those feelings until I look at everyone’s pictures. Then, I’m thinking that this is the life for me. I’m hoping that was the main terror storm.